"Block diagram of the signal-flow for a typical simple delay-line," tied to an electric guitar, for example. Dotted line indicates variable component. Delay is an audio effect which records an input signal to an audio storage medium, and then plays it back after a period of time. The delayed signal may either be played back multiple times, or played back into the recording again, to create the sound of a repeating, decaying echo. Delay effects range from a subtle echo effect to a pronounced blending of previous sounds with new sounds. Delay effects can be created using tape loops, an approach developed in the 1940s and 1950s; analog effects units, which were introduced in the 1970s; digital effects pedals, introduced in 1984; and audio software plugins, developed in the 2000s. The first delay effects were achieved using tape loops improvised on reel-to-reel magnetic recording systems. By shortening or lengthening the loop of tape and adjusting the read and write heads, the nature of the delayed echo could be controlled. This technique was most common among early composers of Musique concrète (Pierre Schaeffer), and composers such as Karlheinz Stockhausen, who had sometimes devised elaborate systems involving long tapes and multiple recorders and playback systems, collectively processing the input of a live performer or ensemble. Audio engineers working in popular music quickly adapted similar techniques, to augment their use of plate reverb and other studio technologies designed to simulate natural echo. In the late 1940s and early 1950s, several sound engineers began making devices for use in recording studios and later more compact machines for live purposes. Les Paul was an early pioneer; a landmark device was the EchoSonic made by American Ray Butts, a portable guitar amplifier with a built-in tape echo which became used widely in country music (Chet Atkins) and especially in rock and roll (Scotty Moore). Tape echoes became commercially available in the 1950s. An echo machine is the early name for a sound processing device used with electronic instruments to repeat the sound and produce a simulated echo. The device was popular with guitarists and was used by Brian May, Jimmy Page and Syd Barrett among others. 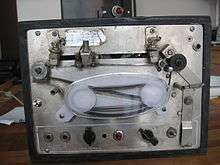 One example is the Echoplex which used a tape loop. The length of delay was adjusted by changing the distance between the tape record and playback heads. Another example is the Roland Space Echo with a record and multiple playback tape heads and a variable tape speed. The time between echo repeats was adjusted by varying the tape speed. The length or intensity of the echo effect was adjusted by changing the amount of echo signal was fed back into the pre-echo signal. Different effects could be created by combining the different playback heads. Some models also included a spring reverb. Before the invention of audio delay technology, music employing a delayed echo had to be recorded in a naturally reverberant space, often an inconvenience for musicians and engineers. The popularity of an easy-to-implement real-time echo effect led to the production of systems offering an all-in-one effects unit that could be adjusted to produce echoes of any interval or amplitude. The presence of multiple "taps" (playback heads) made it possible to have delays at varying rhythmic intervals; this allowed musicians an additional means of expression over natural periodic echoes. Many delay processors based on analog tape recording, such as Ray Butts' EchoSonic (1952), Mike Battle's Echoplex (1959), or the Roland Space Echo (1973), used magnetic tape as their recording and playback medium. Electric motors guided a tape loop through a device with a variety of mechanisms allowing modification of the effect's parameters. In the case of the popular Echoplex EP-2, the play head was fixed, while a combination record and erase head was mounted on a slide, thus the delay time of the echo was adjusted by changing the distance between the record and play heads. In the Space Echo, all of the heads are fixed, but the speed of the tape could be adjusted, changing the delay time. Thin magnetic tape was not entirely suited for continuous operation, however, so the tape loop had to be replaced from time to time to maintain the audio fidelity of the processed sounds. Several designs were made; the 1959 Ecco-Fonic had a spinning head, the Binson Echorec used magnetic recording discs. Many were temperamental, such as the Vox Echomatic. The most successful of the early machines was the 1959 Echoplex by Mike Battle, "whose sounds are still being experimented with today." The Binson Echorec, another popular unit, used a rotating magnetic drum or disc (not entirely unlike those used in modern hard disk drives) as its storage medium. This provided an advantage over tape, as the durable drums were able to last for many years with little deterioration in the audio quality. Often incorporating vacuum tube-based electronics, surviving analog delay units are sought by modern musicians who wish to employ some of the timbres achievable with this technology. Solid state delay units using analog bucket brigade delay circuits became available in the 1970s and were briefly a mainstream alternative to tape echo. The earliest known design, was prototyped at a Boston-based sound reinforcement company in 1976. The core technology used a Reticon SAD1024 IC. This chip and design found its way into the well known Rockman amplifier some years later. In the 1980s, this design was used by BOSS for their mass production product. Though solid state analog delays are less flexible than digital delays and generally have shorter delay times, several classic models such as the discontinued Boss DM-2 are still sought after for their "warmer", more natural echo quality and progressively decaying echos. Additionally, several companies make new analog delays. The availability of inexpensive digital signal processing electronics in the late 1970s and 1980s led to the development of the first digital delay effects. Initially, they were only available in expensive rack-mounted units but eventually as costs came down and the electronics grew smaller, they became available in the form of foot pedals. The first digital delay offered in a pedal was the Boss DD-2 in 1984. Rack-mounted delay units evolved into digital reverb units and on to digital multi-effects units capable of more sophisticated effects than pure delay, such as reverb and Audio timescale-pitch modification effects. Digital delay systems function by sampling the input signal through an analog-to-digital converter, after which the signal is passed through a series of digital signal processors that record it into a storage buffer, and then play back the stored audio based on parameters set by the user. The delayed ("wet") output may be mixed with the unmodified ("dry") signal after, or before, it is sent to a digital-to-analog converter for output. Many modern digital delays present an extensive array of options, including a control over the time before playback of the delayed signal. Most also allow the user to select the overall level of the processed signal in relation to the unmodified one, or the level at which the delayed signal is fed back into the buffer, to be repeated again. Some systems today allow more exotic controls, such as the ability to add an audio filter, or to play back the buffer's contents in reverse. As digital memory became cheaper in the 1980s, units like Lexicon PCM42, Roland SDE-3000, TC Electronic 2290 offered above 3 seconds delay time, enough to create background loops, rhythms and phrases. 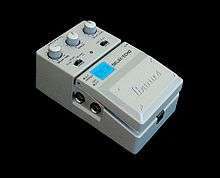 The 2290 was upgradeable to 32 seconds and Electro-Harmonix offered a 16-second delay and looping machine. While the mentioned long delay units were a bit clumsy to create loops, the Paradis LOOP Delay, created in 1992, was the first unit with dedicated looping functions Record, Overdub, Multiply, Insert, Replace, ... Gibson manufactured a slightly improved version as Echoplex Digital Pro  until 2006. Its software Aurisis LOOP is also the last loop tool based on a continuous memory structure as used by tape and digital delays. Most following loopers repeat samples and thus have little in common with a digital delay, the exceptions being Maneco's early loopers, the Boss DD-20 in digital delay mode and the Pigtronix Echolution. A natural development from digital delay-processing hardware was the appearance of software-based delay systems. In large part, this coincided with the popularity of both professional and consumer audio editing software. Software delays, in many cases, offer much greater flexibility than even the most recent digital hardware delays. Abundant system memory on modern personal computers offers practically limitless storage for the audio buffer, and the natural efficiency of audio delay algorithms has made the implementation trivial for delays offering shifting or random delay times, or the insertion of other audio effects during the feedback process. Many authors of software plugins have added functionality to emulate the sounds of the earlier analog units. 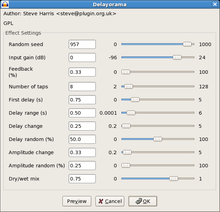 Software-based delays are most popular today among musicians in electronic genres or those who prefer to audition the effect in a digital audio editing and mixing environment. In popular and electronic music, electric guitarists use delay to produce densely overlaid textures of notes with rhythms complementary to the music. Vocalists and instrumentalists use it to add a dense or ethereal quality to their singing or playing. Extremely long delays of 10 seconds or more are often used to create loops of a whole musical phrase. Robert Fripp used two Revox reel to reel tape recorders to achieve very long delay times for solo guitar performance. He dubbed this technology "Frippertronics", and used it in a number of recordings. John Martyn is widely acclaimed as the pioneer of the echoplex. Perhaps the earliest indication of his use can be heard on the songs "Would You Believe Me" and "The Ocean" on the album Stormbringer! released in February 1970. "Glistening Glyndebourne" on the album Bless The Weather (1971) showcased his developing technique of playing acoustic guitar through the echoplex. He later went on to experiment with a fuzz box, a volume/wah wah pedal, and the echoplex on Inside Out (1973) and One World (1977). Martyn is cited as an inspiration by many musicians including U2's The Edge. Echoplex is a term often applied to the use of multiple echoes which recur in approximate synchronization with a musical rhythm, so that the notes played combine and recombine in interesting ways. In fact, it was the name of a particular delay unit, the Maestro Echoplex. Doubling echo is produced by adding short-range delay to a recorded sound. Delays of thirty to fifty milliseconds are the most common; longer delay times become slapback echo. Mixing the original and delayed sounds creates an effect similar to doubletracking, or unison performance. Slapback echo uses a longer delay time (75 to 250 milliseconds), with little or no feedback. The effect is characteristic of vocals on 1950s rock-n-roll records, particularly those produced by Sam Phillips and issued by his label Sun Records. In July 1954, Phillips produced the first of five 78s and 45s that Elvis Presley would release on Sun Record over the next two years, all of which featured a novel production technique that Phillips termed "slapback echo". Phillips noted that no live sound was heard without echo, and hence added the effect to add realism and resultant depth to the played sound. The effect was produced by refeeding the output signal from the playback head tape recorder to its record head. The physical space between heads, the speed of the tape, and the chosen volume being the main controlling factors. Analog and later digital delay machines also easily produced the effect. Irish guitarist The Edge of rock band U2 is well known for popularizing the use of slapback delay as a melodic device in the 1980s. It is also sometimes used on instruments, particularly drums and percussion. Flanging, chorus and reverberation (reverb) are all delay-based sound effects. With flanging and chorus, the delay time is very short and usually modulated. With reverberation there are multiple delays and feedback so that individual echoes are blurred together, recreating the sound of an acoustic space. Straight delay is used in sound reinforcement systems, a straight delay is used to compensate for the passage of sound through the air. Unlike audio delay effects devices, straight delay is not mixed back in with the original signal. The delayed signal alone is sent to loudspeakers so that the speakers reinforce the stage sound at the same time or slightly later than the acoustic sound from the stage, approximately 1 millisecond of straight delay per foot of air or 3 milliseconds per meter, depending on the air temperature's effect on the speed of sound. Because of the Haas effect, this technique allows audio engineers to use additional speaker systems placed away from the stage and still give the illusion that all sound originates from the stage. The purpose is to deliver sufficient sound volume to the back of the venue without resorting to excessive sound volumes near the front. Straight delay is also used in audio to video synchronization to align sound with visual media if the visual source is delayed. Visual media can become delayed by a number of mechanisms, in which case the associated audio should be delayed to match. Delay Time Calculation — learn how to calculate delays using simple math. Ping-Pong Delays — this video shows a type of delay known as Ping-Pong Delay, because it alternates the repetitions from left to right in the stereo field. ↑ Hodgson, Jay (2010). Understanding Records. p. 124. ISBN 978-1-4411-5607-5. ↑ Lehman, Scott. "Effects Explained: Delay". 1996. Retrieved on June 30, 2006. ↑ Gehlaar, Rolf. "Leap of Faith: A Personal Biography of Karlheinz Stockhausen's Prozession. 1998. Retrieved on July 30, 2006. ↑ "RE-201 Space Echo", Vintage Synth Explorer. 1997. Retrieved on July 30, 2006. ↑ Studholme, Richard. "A brief History". Archived from the original on 2007-10-20. ↑ "Paradis Loop Delay". Loopers-Delight.com. ↑ Matthias Grob. "How the Gibson / Oberheim Echoplex Came Together". Loopers-Delight.com. ↑ "Maestro Echoplex tape delay". Retrieved on July 30, 2006. ↑ Rob Bowman. "Phillips, Sam." Grove Music Online. Oxford Music Online. Oxford University Press. Web. 20 Jul. 2016.